Mutton Dalcha Recipe is yet another Hyderabadi cuisine often made with meat or mutton mixed in bottle gourd(kaddu) and dal(lentils). It is the most common dish made in hyderabad which has been passing on since the Nizam’s era. Mutton Dalcha is usually prepared during lunch time. It is a very good combination with Bagara khana. To the Dalcha, we generally add kaddu(lauki in hindi or bottle gourd in english) as the combination of meat, lauki and lentils(toovar dal) along with spices makes the dish very tasty. Adding meat with bones in the Dalcha Recipe gives a very good taste as the juice extracted from the bones and mixed into the daal brings out a very good taste in the dish. Dalcha also brings out a tangy flavor as the tamarind pulp is added while making the dish. Other hyderabadi dal which is incomplete without adding tamarind is hyderabadi khatti dal. The accompaniments that can go well along with this recipe is mutton fry recipe or it is also good with meat or mutton shami kabab and rice. Tamarind pulp is the main ingredient as the recipe is not in a good taste without the tangy tamarind pulp. It is made during occasions and is a wonderful side dish eaten with special rice delicacies. 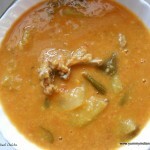 Here in this recipe I have made dalcha with toovar dal(yellow lentils)/ toor dal. The same dalcha can be made without the mutton and is called as kaddu dalcha. Dalcha can also be prepared with chana dal and mutton and to know more about that recipe read on my dalcha recipe from the blog. Let us get to know the details of making Hyderabadi Mutton Dalcha Recipe. Dalcha recipe made by tenderizing mutton along with dal. In a pressure cooker, add toovar dal, add turmeric powder, add curry leaves, add water and pressure cook until the dal is tenderised. Cook it for about 10 minutes or 5-6 whistles. Reduce the steam of the cooker,mash the dal by adding salt, add tamarind pulp,mix well,check if salt is required and keep aside. Meanwhile tenderise the mutton. In a pessure cooker, heat oil, add cinnamon stick, add the onion slices and saute for a while, add ginger garlic paste saute well. Add the mutton pieces and fry for awhile, add salt, red chilli powder(or green chilli paste), pinch of turmeric, coriander powder, add chopped tomatoes stir well. Add little water and pressure cook until the mutton gets soft. To the cooked mutton, add bottle gourd(lauki) slices, salt if required, pinch of red chilli powder, curry leaves, chopped tomatoes, coriander leaves and pressure cook again for about 3 whistles for the lauki to get soft. Lastly Combine evrything that is the dal with tamarind pulp and the mutton curry made with kaddu. To it add garam masala powder, curry leaves, coriander leaves, add some sugar to kill the sour taste(optional). Bring the whole mixture to a boil. Serve with rice or bagara khana. 1.I have cooked mutton then added lauki to the same pressure cooker. 2.We can Cook dal with tamarind pulp, mutton curry, lauki separately and combine all the three then bring a boil, it brings out the same taste. 3. I have used toovar dal but chana dal too can be a substitute.